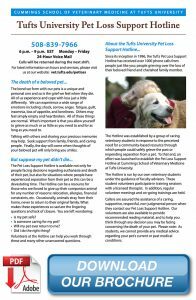 Modeled after the pet loss hotline at the University of California, Davis, the Tufts University Pet Loss Support hotline began in 1996 as the initiative of former veterinary student, Tami Pierce (V'97). Through training and monthly group debriefing with a mental health professional, every volunteer learns about the process of grieving and how people react to the loss of pets. We realize our duty is not to provide counseling or help people forget about their problems. Our goal is to support people as they work through the pain and grief that is often associated with pet loss. 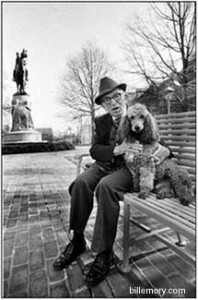 We know the special bonds people have with their pets, and owners appreciate being able to talk with individuals who share their compassion for animals and understand the impact of their loss. On the hotline, callers speak one-on-one with student volunteers. There is no formula for any conversation. Our volunteers listen to callers as individuals, realizing that no two callers are alike and that everyone's situation will be different. Hotline volunteers may also offer to send a personalized packet of information to the caller as a supplement to the conversation. These packets contain articles and book lists tailored to what the hotline volunteer thinks would be most appropriate for the caller. Ultimately, we'd like to leave callers with the knowledge that they are not alone, and that they are not silly or ridiculous for having strong feelings over the loss of their pets. Having to say goodbye to a good friend should be handled with as much compassion and understanding as possible. That is the kind of support we hope to offer.